Conner’s only crime was to have an uncertain temper and to be a rather unruly teenager. Risa’s was that she was an orphan and that the system could no longer afford to keep her. Lev’s was that he was the tenth child and was therefore the one who had to be tithed, according to his parent’s religious beliefs. All three are going to be “unwound” - their bodies will be taken apart and their parts will be given to others. The authorities say that they will not really die, that they will continue to live in the people that they help, but Conner and Risa at least think otherwise. The whole idea of unwinding children began when the pro-life and pro-choice conflict came to a head and lead to a war. Almost in jest someone at the negotiating table suggested that instead of terminating fetuses, people could recycle teenagers instead. To the horror of many the idea became law. Now parents, guardians and the government can choose to unwind any child between the ages of thirteen and eighteen. The only requirement is that every part of the body has to be used so that the child can go on living, or so they say. Connor and Risa both decide that they will not go down without a fight and they run away. Lev ends up getting caught up in their escape and is swept along whether he wants to go or not. At first he doesn’t want to go with them at all. He believes in the tithe. But, over time he begins to change his mind. He begins to see how cruel and wrong unwinding is and he finds a new cause – to fight against the system. Connor and Risa are rescued by a secret underground movement that works to get runaway unwinds off the streets and to safety. They end up living in the middle of the desert in Arizona where they are given a purpose and where they finally start to feel safe. Then everything falls apart and they are worse off then ever. In this startling, often disturbing, and sometimes painful book Neal Shusterman tells the story of these three young teenagers from their point of view and in their voices, alternating between them. 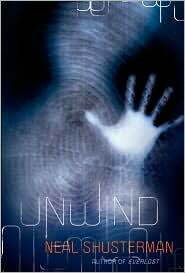 It is hard to imagine a world where things could go so wrong that anyone would consider ‘unwinding’ another human being, but as one reads one sees how it happened and how it came to be accepted. It is fascinating to see how the characters evolve, particularly Lev, who goes from blindly believing in unwinding, to hating it with a passion. Connor too changes a great deal as he takes his extraordinary journey from being a runaway unwind who is always angry to being a young man with a purpose who is able to lead others. Superbly written and crafted, this book will grip its readers and make them think long and hard about themselves and what life means to them.